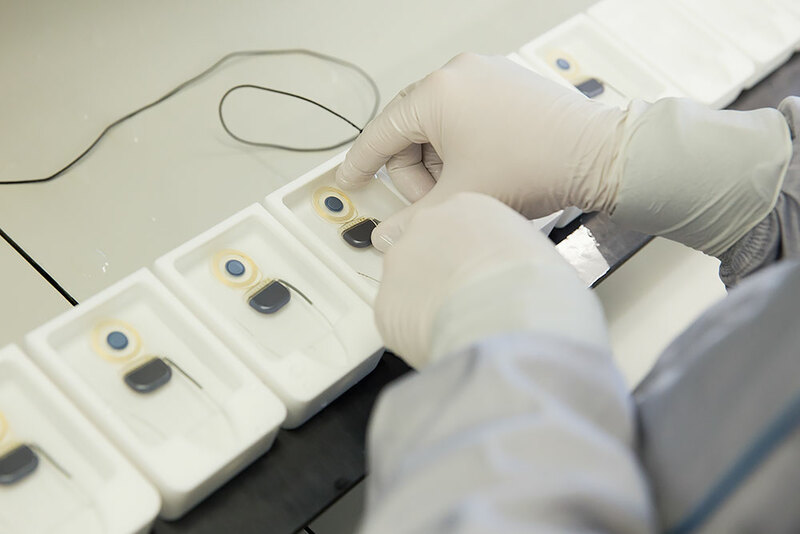 Have you ever seen how a cochlear implant is made? 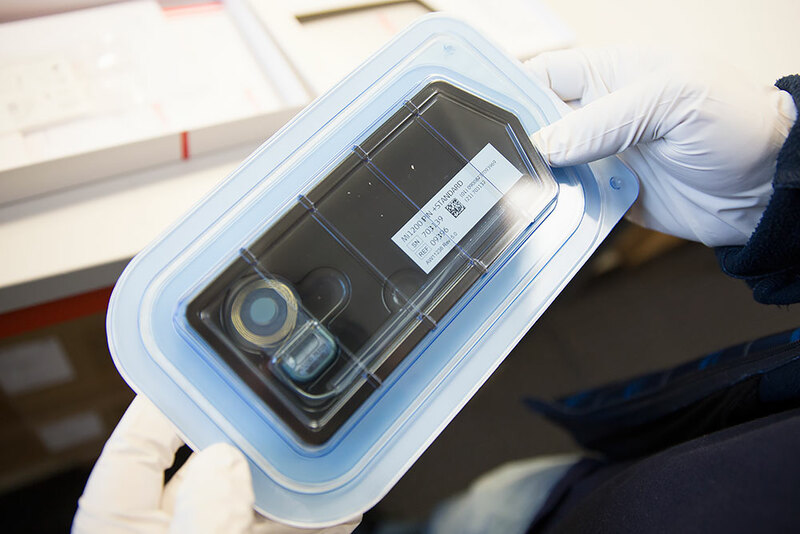 We’re excited to be able to show you these exclusive pictures that document the entire manufacture of a cochlear implant here at MED-EL. This is the second part of the story: manufacturing the implant. The first part was an in-depth look into how electrode arrays are made, so if you haven’t seen that post, you should check it out first. Now, take the next step with us as we head straight into our implant manufacturing facility. 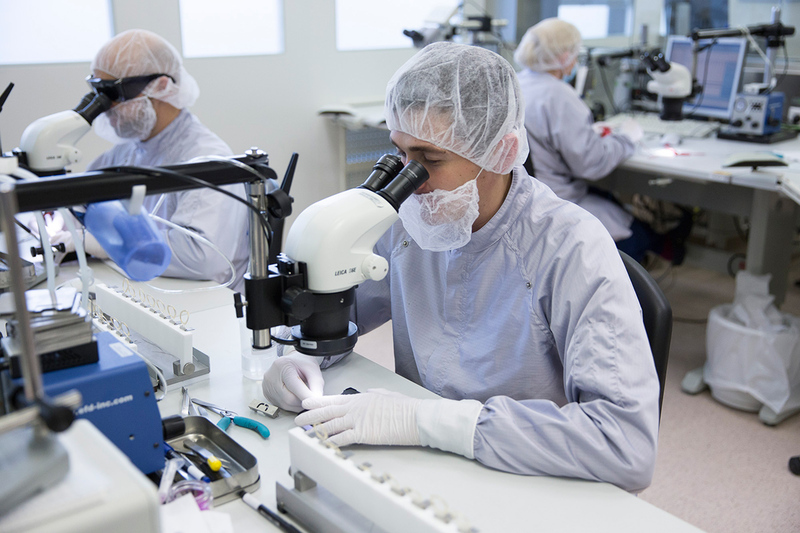 Here’s how your cochlear implant is made. 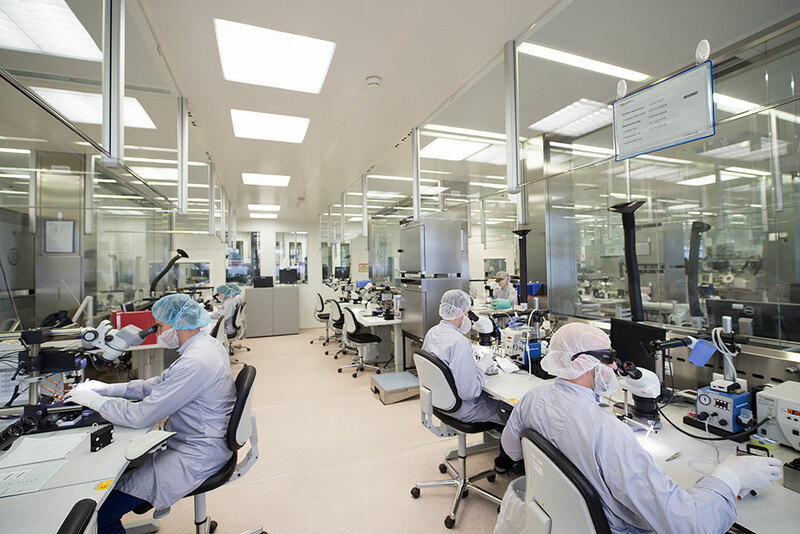 Here’s where our specialists make the finest of cochlear implants. The manufacturing room takes up an entire floor at our headquarters. 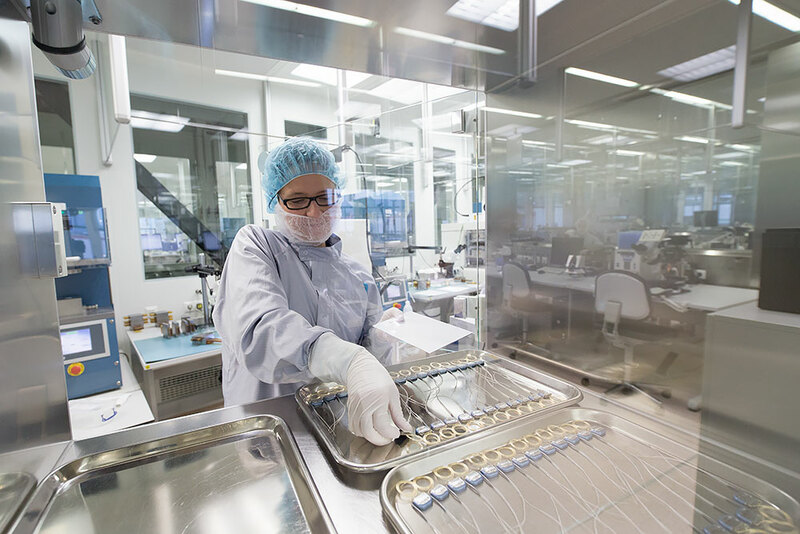 Like the electrode arrays clean room, this room is specially filtered from any dust or foreign particles. In total, we dedicate about 3,600 square meters to manufacturing. Much of it is dedicated to manufacturing the implant itself, which is what we’ll show you in the pictures below. This is where it starts: the electronic brains behind a cochlear implant. Each of these blue cases contains the computer chips which send sound signals to the electrode array. The electronics are housed inside a solid block of titanium for the maximum in durability. The seam between the two parts is laser welded, which keeps the electronics completely isolated from anything outside the titanium case. A MED-EL cochlear implant sends sound information to the cochlea at a speed of up to 50,000 times per second. They can even send sound to different parts of the cochlea—at exactly the same time. This means a MED-EL recipient has access to up to 250 unique pitches of sound. After the precision laser welding, they’re ready to be built into a cochlear implant. But before that, each one is put through a rigorous quality control test of the electronics and case. 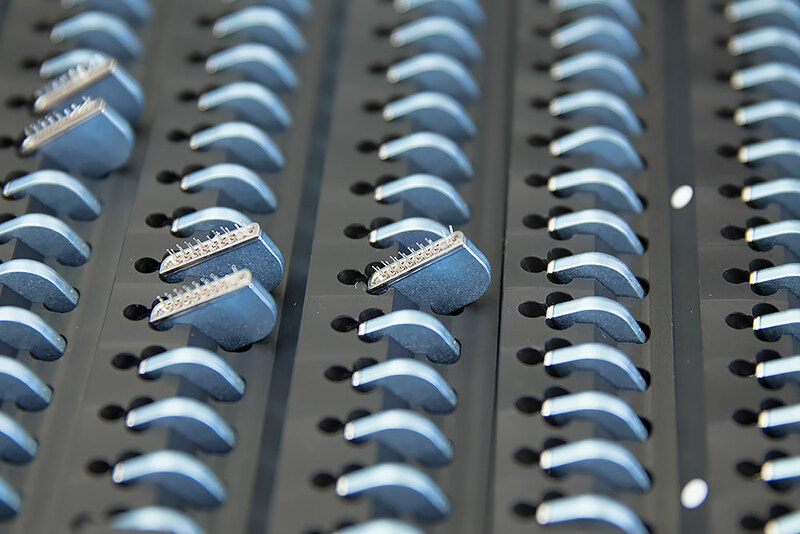 As an implant is manufactured, it’s moved along an orderly line through our manufacturing room. For some of these steps, it needs to go into an additional clean room that is itself inside the main clean room. To get between these different rooms, the implants have to pass through a special air lock. Only one side of the chamber can be opened at a time, which keeps the atmosphere in each room isolated. In the picture below, you can see a specialist moving implants through that air lock and onto the next step: being sealed in silicone. This bench is where the implant reaches its final form. The assembled electronics, electrode array, and coil are laid by hand into a metal form. This form is then sealed and injected with silicone. After the silicone is cured, the form is opened up and the implant is born. In the picture above, the implants at the very top have not yet gotten their silicone coat. The one in the middle has just been taken out of the metal form, and it’s as close to a brand-new cochlear implant as you’ll ever get. At the bottom, you can see a specialist sealing up one more implant for its journey. At this point the implant could be packaged, sterilized, and sent to a hospital, but that’s not good enough for us. They’re almost done—but not quite. At the very end of the line is a full battery of tests. 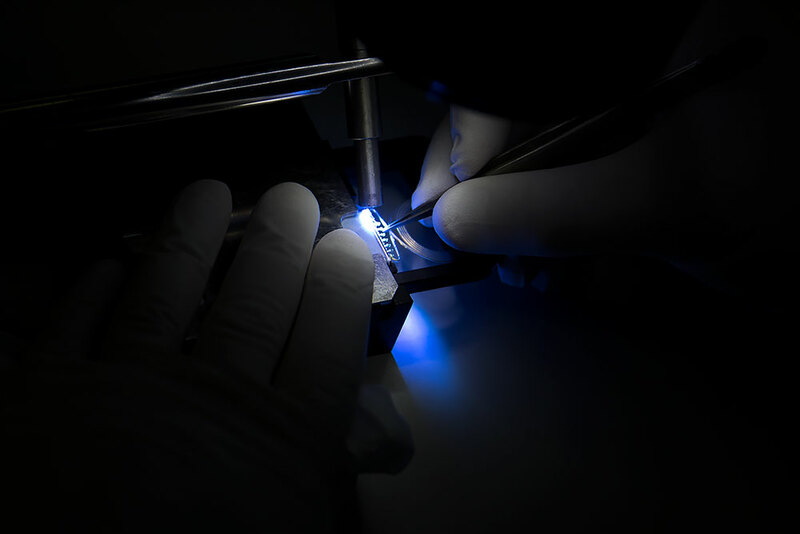 In this picture, the specialist has put the implant in a special liquid and connected it to a processor coil. This test checks that the implant can receive sound signals from the audio processor. So here it is: a finished MED-EL cochlear implant. It’s sealed up in a specialized package, sterilized so that it has a three-year shelf life, and will stay like this until a surgeon opens it up just before surgery. So, this has been a brief tour into the actual manufacturing of a cochlear implant. Next week we’ll dive into developing the next generation of cochlear implants: the work of our research and development engineers. Subscribe to the MED-EL Blog to make sure you get all the fun and informative posts like this one, delivered straight to your inbox!